Apologies for the infrequent posting of late, but sports (which I don't like anymore) and other real-life developments have intervened. Hopefully you'll see a return to regular service over the coming days and weeks. For now I just want to direct your attention to a few interesting Russia-related pieces: first off, you should definitely read this op-ed in Politico about the continued significance of Russia to U.S. national interests. It's by Graham Allison and Robert Blackwill (who, not incidentally, are promoting the release of a report they've written on the subject; it just went live in the last hour or so, and I haven't read it yet). I tend to be skeptical about the deterministic certainty so many analysts seem to feel about the potential security consequences of demographic change around the world, but I'm not really a public health guy, and you'll be unsurprised to learn that I know very little about the subject. Like everyone else, I've seen references to the forthcoming bizzaro-Malthusian birthrate crisis in Russia and Japan and western Europe, etc etc, usually accompanied by alarmist commentary about the inevitable and compensatory rise in Muslim/Latino/Other Scary Brown People immigration. To get the other side of the story, check out Mark Adomanis's response to Eberstadt on the Forbes website. I always enjoy graphical pwnage, and Adomanis delivers it in force with a concise criticism of Eberstadt's use of statistics. Who needs bipartisanship when we've got pervasive groupthink? Les Gelb has a not-very-interesting article in the newest issue of The National Interest entitled "We Bow to the God Bipartisanship." In it, he derides what he views as the tendency to overrate the value of bipartisan support to presidents' ability to carry out their foreign policy preferences. "[B]ipartisan backing at home has too often been purchased at the price of good policy abroad," Gelb tells us. This is a curious assertion, especially since Gelb spends much of the next 3,000 words supplying historical evidence for precisely the opposite point of view: presidents have in large part ignored domestic criticism and succeeded in enacting policies that ranged from the grievously wounding to the mildly successful. The only real support Gelb provides for his thesis statement comes in the form of fact-free assertion about the Obama administration's purportedly craven pursuit of popular policies "where it has little faith its efforts will succeed," as in the case of Iran, North Korea, Middle East peace, and Afghanistan. To which I can only muster a disinterested and disbelieving "meh." My initial support for the war was symptomatic of unfortunate tendencies within the foreign policy community, namely the disposition and incentives to support wars to retain political and professional credibility. Incentives, eh? Perhaps all this "bowing to the god bipartisanship" is more of a distasteful personal habit, one that's left our man with a bit of a guilty conscience. Time. Realizing I haven't been posting that often, I have found that I have been spending a large amount of my time thinking about posts to write, reading other blogs, and tooling around on Twitter. Those of you who know me personally know that I have had a tough couple of years personally and professionally and Ink Spots (and the military blogo/twittersphere in general) has taken time I do not really have to give. I have a lot things to get in order and this is just not fitting. It is time to reorient on my priorities. Perspective. Over the past few months I have found myself entrenched on issues and not engaging with others as I had previously. That does not mean that I do not feel strongly about a number of issues, but I am not adding to the dialogue any longer and rather feel like a broken record. I have also found myself internally gauging the success of my posts based on how many people tell me I am right and caring more about page views than content. That is not why I started blogging and I do not wish to continue to do this. Some time off may help with this. Professionalism. With my change in jobs this past spring, I have changed focus in my professional life. While still working on Defense issues, I do not work on policy any longer. It has been too difficult to stay up to date on issues that I like to blog about while attempting to gain and maintain an edge in my new endeavors. I'll leave it at that before we break out into an episode of Oprah. My name will stay on the masthead (hey, even if I take 6 months off I'll still post before three of our other contributors! (kidding! )(sort of...)). If there is something someone out there is just dying to hear my opinion on, just email me and I'll be willing to write a guest post somewhere. And if no one wants that, that's okay, too. I'll probably run into a number of you out and about DC and I look forward to that. Otherwise, I'll be back in the spring - hopefully with my life a little more orderly and ready to comment on all sorts of issues. Talk to you then. U.S. troops and the LRA: What exactly IS "your typical advise and assist mission"? As you've no doubt already heard, the president is sending approximately 100 U.S. military personnel to central Africa to aid partner security forces in the capture or killing of Joseph Kony, leader of the murderous Lord's Resistance Army. The public found out about this when President Obama informed Congressional leadership in a letter delivered last Friday, as he is statutorily required to do. A number of analysts and commentators have offered thoughts on the matter -- Crispin Burke has a brief but representative rundown on Wings Over Iraq -- but most have failed to provide the sort of context necessary to understand how a mission of this type is carried out. By extension, many people are drawing bad conclusions about what this development means for the U.S. in Africa and for our broader national security policy. First things first: what is it that U.S. military personnel are meant to do here? According to the president, this "small number of combat equipped U.S. forces" will "provide assistance to regional forces that are working toward the removal of Joseph Kony from the battlefield." But Barbara Starr told us yesterday that the African enterprise is "not your typical advise and assist mission"; how exactly the folks at CNN Security Clearance would define such a thing is left to our collective imagination, but perhaps her explanation can give us some clues. President Obama’s decision to send 100 troops, mainly U.S. Special Forces, to Uganda to help hunt down leaders of the violent Lord’s Resistance Army is not meant to be a combat mission. But the troops will be well equipped if the need to fight arises, them CNN has learned. The troops will have so-called “crew-served” weapons in the field. These weapons, unlike a rifle or machine gun, requires more than one person to operate them, such as one person loading ammunition while the other person aims and fires. The deployment of these particular combat weapons triggered the need for the Obama administration to publicly notify Congress of the operation under the War Powers Resolution, according to a Department of defense official. That requirement demands that any time troops are put into a country “equipped for combat” Congress must be told to avoid any prospect of a secret war, the official explained. Let's get the obvious objection out of the way: a machine gun is in fact the very most common and obvious example of a crew-served weapon (pdf). Such a basic error might call into question Starr's reliability and authority on the matters a "Pentagon correspondent" has responsibility for covering. But what about the meat of what I gather to be her argument -- that "deployment of these particular combat weapons" both triggered the WPA reporting requirement (an assertion she attributes to her source) and more generally indicates that the function these personnel will be performing is somehow atypical or rare? Well, both points are pretty plainly wrong. The law (50 U.S.C. §1543) does require presidential notification when U.S. troops are sent to a foreign country "equipped for combat," as Starr notes. But the suggestion that crew-served weapons mark the threshold between being "equipped for combat" and everything else strikes me as wholly arbitrary. It's obviously a matter of interpretation, as the law doesn't specify the meaning of the term. But Starr and her helpfully explanatory official seem to have missed the much more important provision of the law: the section that explains the meaning of "introduction of United States Armed Forces" (50 U.S.C. §1547 (c)). So let's get this straight: CNN Security Clearance wants you to know that this deployment is "not your typical advise and assist mission," apparently because it triggered the WPA reporting requirement. But that requirement applies to every instance in which U.S. forces partner with, augment, lead, or advise a foreign military force that's actually engaged in fighting. Advise and assist is a SFA task in which U.S. personnel work with FSF [foreign security forces] to improve their capability and capacity. Advising establishes a personal and a professional relationship where trust and confidence define how well the advisor will be able to influence the foreign security force. Assisting is providing the required supporting or sustaining capabilities so FSF can meet objectives and the end state. It might have been appropriate for Starr to argue that "this is not your typical training mission," or even to say "this is not your typical security force assistance mission." But this is precisely "your typical advise and assist mission." The distinction is a matter of more than just semantic interest, and to show you why, I'm going to talk for a little while about what's called foreign internal defense. [T]he participation by civilian and military agencies of a government in any of the action programs taken by another government or other designated organization, to free and protect its society from subversion, lawlessness, insurgency, terrorism, and other threats to their security. To put it more simply, FID encompasses whole-of-government efforts undertaken to help another government deal with internal threats. The U.S. military's view of its role in those efforts is explained in doctrine (specifically JP 3-22 Foreign Internal Defense and FM 3-05.137 Army Special Operations Forces Foreign Internal Defense), which characterizes DoD activities as being of three types: indirect support, direct support (not involving combat operations), and combat operations. Indirect support in FID is primarily focused on enabling the host/partner-nation government and security forces to accomplish their internal defense and development objectives independently; it's how the USG helps another government do what it needs to do without doing it for them. This category of activity includes the sale or transfer of military equipment, training of partner-nation units and individuals, personnel exchange programs, and combined exercises. Indirect support is going on every day and with a wide range of countries. Selling helicopters to Mexican federal police? Putting a Filipino special forces officer through the Maneuver Captain's Course? Transferring NVGs to Pakistan for their pilots to use in the frontier provinces? All FID indirect support. Direct support (not involving combat operations) is where FID really starts to distinguish itself from security force assistance, security assistance, and security cooperation: it entails U.S. military forces providing direct assistance to the host nation's security forces or populace. This type of activity typically takes place during violent conflict, but that need not be the case. Direct support basically means U.S. forces providing, augmenting, or amplifying under-developed or nonexistent host-nation capabilities like intelligence collection, communications, logistics, psychological operations/military information support, and civil-military operations (provision of basic services to the civilian population). Training partner security forces can also be identified as direct support or indirect support depending on the urgency and immediacy of the effort. (U.S. personnel putting Afghan National Army troops through basic combat training prior to operational deployment constitutes direct support, while training an Egyptian mechanic on how to maintain his airplanes might be indirect support.) We're doing FID direct support in a few places right now, with the most obvious being Afghanistan and Iraq (though much of our activity there has transitioned into indirect support as Iraqi security forces have achieved autonomous capability). That thing counter-LRA Starr mentions in her blog from back in '08, the curiously-named Operation LIGHTNING THUNDER, when 17 U.S. advisors gave comms help and intelligence information to Ugandan forces going after Kony? That was direct support. The primary role for U.S. military forces in tactical operations is to support, advise, and assist HN forces through logistics, intelligence or other support and means. This allows the HN force to concentrate on taking the offensive against hostile elements. If the level of lawlessness, subversion, or insurgency reaches a level that HN forces cannot conrol, U.S. forces may be required to engage the hostile elements. In this case, the objective of U.S. operations is to protect or stabilize the HN political, economic, and social institutions until the HN can assume these responsibilities. The precise character of FID combat operations is determined not only by operational requirements but also by the type of formation or personnel participating in the mission. Individual embedded advisors or small advisor teams will obviously be unlikely to undertake offensive operations as a constituted whole simply because of a lack of combat power, while an Advise and Assist Brigade maintains the capacity and capability to perform full-spectrum operations and could independently find, fix, and finish the enemy's maneuver elements if required. As you may have worked out from the excerpt above, "combat operations" in this context include things that would be considered "combat support" in a U.S. operational context: enabling functions for maneuver formations engaging the enemy. The reason they constitute FID combat operations is that they expose U.S. troops in the field to hostile action. If you're trucking host nation troops up to the front or turning a wrench on a busted vehicle while taking mortar fire at a forward location, you're performing a direct support function, but the exposure to hostile fire qualifies this as FID combat operations. Ok, good, so we're all sorted out on FID, right? Then let's get this straight: the USG is doing all three types of FID in central Africa. Indirect support in the form of materiel assistance was announced several months ago. We've done direct support (not involving combat operations) at various times over the last several years, including intel-sharing during LIGHTNING THUNDER. The (presumably) Special Forces soldiers going to central Africa will likely continue to perform similar direct support activities from rear areas while also in some instances engaging in combat operations by embedding with Ugandan, Congolese, South Sudanese, and/or Centrafricain military formations. So what's new about all this? Nah, it's not about crew-served weapons. It's not about any imagined intent for SF ODAs to conduct direct-action missions against Kony and his "army." It's about the simple fact that the law requires Congressional notification in any instance when U.S. forces may be exposed to hostile fire, including those times when they're embedded or partnered with host nation forces. As I've said above: this is the very essence of an advise-and-assist mission. In point of fact, it's nigh-on impossible to perform the advise-and-assist task without the presidential decision required to permit FID combat operations, at least assuming the supported foreign force is actually engaged in a fight. (And if it's not, then the SFA task U.S. forces are performing in support of them is much more likely to be training or equipping than advising and assisting, which is a term which almost universally connotes combat action. I'm at pains to think of a single instance of what I could call an advise and assist mission that does not involve combat of some type. American military personnel have provided support to foreign security forces through FID and SFA for decades, if not longer. They've done so in Russia during the post-revolutionary civil war, in Vietnam, across Latin America during the Cold War, in Colombia, the Philippines, Iraq, and Afghanistan in the modern day. In every instance in which they've been exposed to hostile fire, they've required a presidential determination to that effect (enabled by either a declaration of war, a WPA notification, or an executive order/presidential finding/PDD). This instance is perhaps noteworthy to the media and the public because President Obama has decided not to ignore what's required of him by law (including a declaration of "the constitutional and legislative authority under which such introduction [of U.S. forces] took place") and instead sought to legitimize the effort by expressly citing the Congress' very own appeal for action: the Lord's Resistance Army Disarmament and Northern Uganda Recovery Act of 2009 (pdf). And that's the great irony of all this, really: the media, the public, and apparently the Congress have been so inured to the wholesale and systematic hostility of successive presidential administrations to the distribution of war powers in American law that it's more noteworthy when the president does things properly. This is precisely the sort of activity that it ought to be a presidential prerogative to undertake: FID is fundamentally a matter of foreign affairs, not war, and the Congress should be made aware and kept informed insofar as military activities pursuant to the effort may unintentionally entangle the U.S. in a foreign conflict. I know, I know: I can't even defend the president on this issue without complaining obliquely about Libya or Afghanistan! And it wouldn't be my style to go to all this trouble talking about a troop deployment without talking about strategy, but I'll be brief (and I'll probably surprise you): I explained why I'm ok with the process of this decision, but I don't have a big problem with the substance of it, either. This sort of FID mission isn't going to cost a tremendous amount of money, and the risk to U.S. personnel is relatively low even if we make an uncharitable estimate of it. It's hard to say that we're risking even a temporary diminution of U.S. readiness or combat power simply because it's such a small number of troops. There is very little risk of unintended escalation (though we should always be wary), and if the president determines that escalation is desirable or necessary, it seems plain to me that he has set the rather unique precedent of needing to take such a decision before the Congress. This type of mission is exactly what SF were conceived, organized, and trained to do. Don't be fooled into thinking this is some kind of panacea, a universalizable model for all future American military action, the cornerstone around which we can base our future security policy. But it seems like a just, affordable, and doable thing that stops short of war, and in this case, I don't see anything particularly un-strategic about it. There is no kinder, gentler war. Its formula has never been found -- not through strategic bombing, maneuver warfare, the indirect approach, or "cyberwarfare." This is a fact to which history will attest. In a piece subtitled "why the electronic wars of the future will actually save lives," Tim Maurer yesterday argued that "cyberwarfare" can make war less violent and destructive; the rise to prominence of what we often hear described as "non-kinetic" means could allow for a brighter, "humanitarian" future in which fewer people are killed to accomplish political change. The prevailing view, however, holds that cyberwar is a terrifying prospect... Yet the evidence of cyberwarfare, so far, reveals a very different picture. The cyberattack on Estonia in 2007 was the first to make major international headlines. But its damage was limited: The Distributed Denial of Service (DDoS) attack overburdened servers in Estonia and brought down several websites. Something similar happened in Georgia during the war in 2008. Such attacks could theoretically cost lives if they shut down emergency hotlines, for example. But they're not the sort of thing that should keep us up at night. [...] Cyberwarfare might be how we will fight the battles of the future. The evidence so far suggests, however, that a digital Pearl Harbor would cost fewer lives than the attack 70 years ago. It might not be pretty, but from a humanitarian point of view, that's good news. But as Thomas Rid convincingly argues in a recent article ($) for the Journal of Strategic Studies, it's hard to think of such actions as really constituting "war" at all. Rid and Maurer agree that so-called "cyberwarfare" will likely be less dangerous than many forecasters predict, but the more optimistic Maurer fails to carry this observation to its inevitable Clausewitzian conclusion: war itself exists as a political phenomenon largely because other policy means are sometimes ineffective, and "less dangerous" very often means less useful. To achieve the end of war, one opponent has to be rendered defenseless. Or, to be more precise: the opponent has to be brought into a position, against his will, where any change of that position brought about by the continued use of arms would bring only more disadvantages for him, at least in that opponent's view. Complete defenselessness is only the most extreme of those positions. Violence, threatened or actual, is what defines an act of war; violence is what destroys the enemy or breaks his will -- that intangible force that sustains his resistance -- and thus compels decision. The level of violence, destruction, and/or dislocation that's required to achieve this end varies according to context and the enemy's specific character: it can span from a show of force (threatened violence to deter enemy action) to a battle of envelopment and annihilation (in which "complete defenselessness" is enacted on the enemy). But all acts of war are merely means to this end. Maurer is hopeful of a world where aggressive non-kinetic actions may be usefully employed by governments to accomplish policy aims short of violence, and I applaud his optimism. It can hardly be a bad thing if states have more ways to solve their problems short of war, and such flexibility can certainly save lives. But imprecise and misleading use of "war" vocabulary can lead us to forget that battle, death, destruction, violence and coercion remain as ever the "last argument of kings." "Cyberwarfare" may give us a less dangerous instrument of policy, but it won't change the escalatory logic and fundamental violence of war. The "electronic wars of the future" will only save lives if the methods we develop to "fight" them can replicate the coercive power that has, to this point in history, only consistently been achieved by death and destruction. DO NOT DARE COUNTENANCE VIOLENT, COERCIVE ACTION AGAINST US! If Iran was willing to countenance... Let's put this in plain words: Steve Clemons is saying that the United States ought to muster "a significant strategic response" -- presumably involving direct action by intelligence agencies or military force -- to the apparent revelation that a regional power on the other side of the globe might even consider aggressive action against U.S. and allied interests. No wonder we need a $700 billion defense budget: some of us are planning strike operations at the hint of an anti-American plan. Today marks the ten-year anniversary of the first U.S. military strikes in Afghanistan. Perhaps to commemorate the event, insurgents struck four American combat outposts along the Pakistani border with coordinated 107mm rocket attacks. Considering their proximity to the frontier, the attacks are thought to have been staged in Pakistan. [The attack] also highlighted the relative weakness of Afghan soldiers and police officers living and working on the American-built bases. As the attacks escalated in the morning, only the United States military possessed the firepower, communications and skills to fight back in what developed into a long-range, artillery-and-rocket duel. While the American soldiers organized and coordinated their part of the battle on the outpost here, the Afghan soldiers did not participate. Some simply sat and watched. The U.S. presence in Afghanistan will gradually draw down in the coming months and years. We are told this drawdown will proceed at a pace that is sensitive to the timeline on which that country's security forces grow more capable of dealing with the insurgency independently. According to the commander of the combined U.S./NATO organization responsible for training, equipping, and advising those Afghan security forces, there are currently two (of around 180 total) Afghan National Army battalions capable of independent operations. Even those formations cannot function without what the U.S. military calls "enablers" -- logistics, maintenance, and sustainment support -- which don't exist in the ANA. The "independent" Afghan battalions still must largely be transported, tuned up, and treated by coalition assets and personnel. Osama bin Laden is dead. al-Qaeda is presumed not to exist in numbers larger than the dozens on Afghan territory. The Taliban government that coddled and sustained them has been gone for a decade, and shows little sign of again taking up such manifestly unhealthy behavior if given the opportunity to do so. To all the men and women in our military, every sailor, every soldier, every airman, every Coast Guardsman, every Marine, I say this: Your mission is defined. The objectives are clear. Your goal is just. Today, ten years later, American soldiers had rockets fired at them by men who had nothing to do with 9/11, men who slipped into Afghanistan from a neighboring country with which we are not at war, and who returned there after the attacks. The tactical task those U.S. soldiers performed today -- returning fire in an effort to destroy the enemy -- was only one half of a mission, which consists of a task and a purpose. At the strategic level, U.S. forces' mission in Afghanistan is no longer defined: the purpose of OEF is obscure and its component tasks lay beyond the reach of the American armed forces. The objectives may be clear, but they are largely inaccessible to our ways and means. The goal may be just, but such judgments are strategically irrelevant. How many more must die or be ruined for the indefinable "success" of this insensate mission? 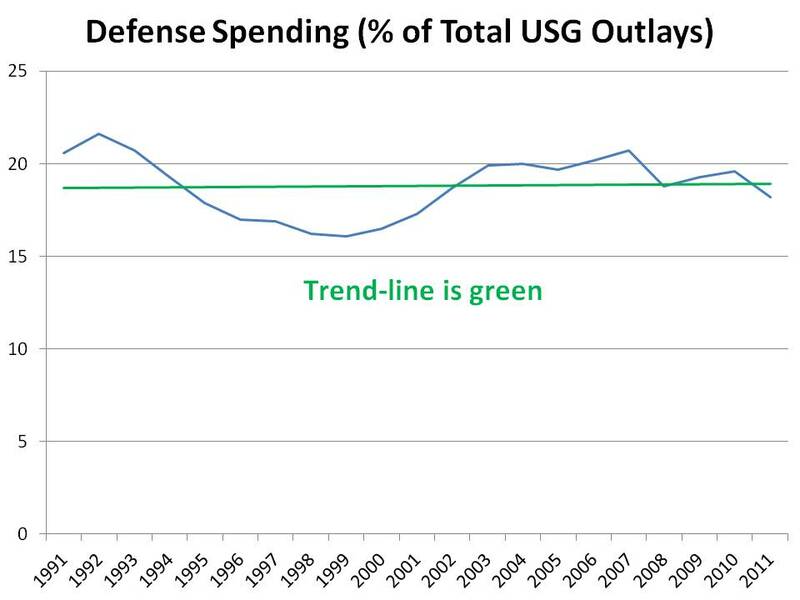 Defense-defenders are lying again: ground forces are not "stretched beyond their limits"
Tom Donnelly and Gary Schmitt have yet another whine-piece in The Weekly Standard today, telling us how they're just mad as hell about defense budget cuts and they're not going to take it anymore! It’s time to say “enough” and to refuse not only sequestration but also a deal that avoids automatic reductions by substituting “just” a couple of hundred billion more in defense cuts. These are “savings” the nation cannot afford. It's not clear to me just exactly how that would happen, considering, you know, the law and all. But more interesting is the loony explanation for why such cuts are unacceptable. 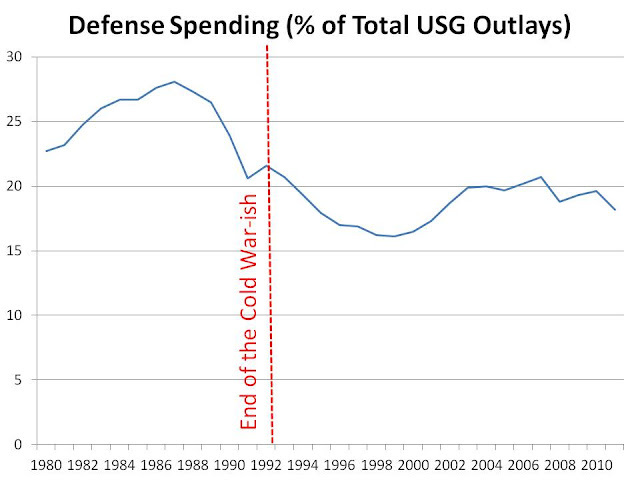 The fact is that the United States has been in an extended “defense drawdown” since the end of the Cold War, reaping substantial “peace dividends” throughout the Clinton years, during the Obama years, and now under the Budget Control Act. Wonder what that ol' drawdown looks like in graphic form? UPDATE: If you want to see it adjusted for inflation (as if we don't already know how that one looks, too), check out the first graphic in this pdf from CFR's Center for Geoeconomic Studies. Notice that the line isn't going downwards. 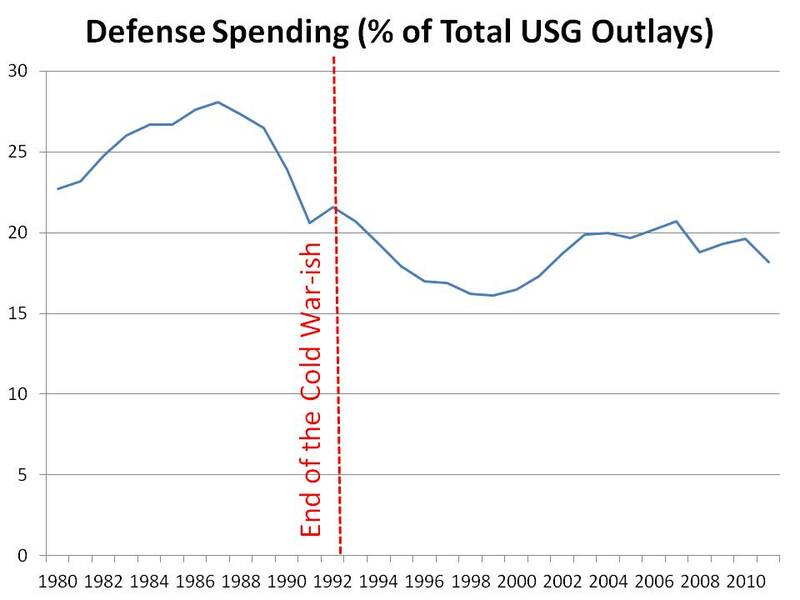 Which is how it would look if we were in fact in an "extended defense drawdown since the end of the Cold War." And how about this canard? Consider the personnel strength of the Army and Marine Corps. Even with 771,400 soldiers and Marines on active duty, both services remain stretched well beyond their limits. This is simply false. There is just no other way to put it. The Army and Marine Corps are not "stretched well beyond their limits." They're not even stretched to their limits, or really even very close to their limits. We've talked about this before; while the idea of going to a greater than 1:2 or even 1:1 BOG-to-dwell ratio may not be very attractive to anyone involved, that's what we're talking about when we use terms like "stretched to the limit." When will the defense-defenders stop trying to BS the credulous? There are a lot of problems with the way the U.S. government crafts and communicates national strategy. If I were to run them down (which I'm not going to do here, but have done before), I might begin with the most glaring: almost none of them meet even the most very basic test to be accurately identified as strategy: they do not comprehensively consider ends, ways, and means. This goes for the National Security Strategy (published by the White House), the National Defense Strategy (published by the Office of the Secretary of Defense), and the National Military Strategy (published by the Chairman of the Joint Chiefs); it also applies to the QDR Report, which makes no titular claim to be a strategy but which is required by law to contain "a comprehensive discussion of the national defense strategy of the United States, the strategic planning guidance, and the force structure best suited to implement that strategy at a low-to-moderate level of risk." This year, something unexpected happened. In April, after the Pentagon crafted its budget, President Obama announced that the Defense Department needed to chop $400 billion out of its budget over the next decade. 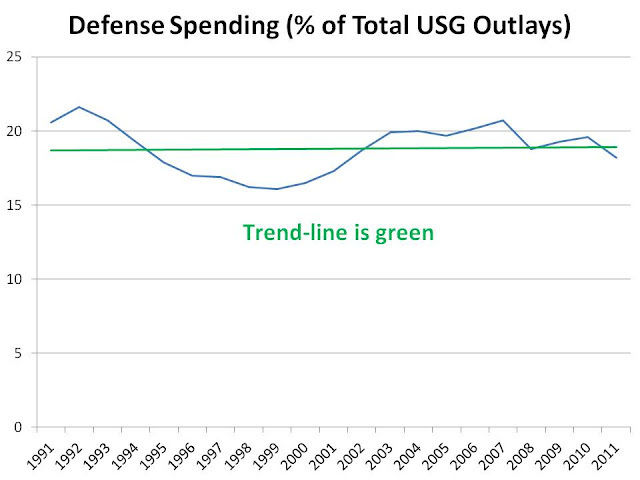 (Since the Pentagon will spend, unimpeded, $5 trillion over the next decade, that might not look like such a big number.) Outgoing Secretary Gates reluctantly said that the Pentagon would conduct a review of "roles and missions" to proritize -- and potentially jettison -- to guide the cuts. Wait a minute, you might think. Why not just use the QDR for that? Pursuant to 10 U.S.C. 118b, each Quadrennial Defense Review (QDR) shall be conducted so as "to make recommendations that are not constrained to comply with the budget submitted to Congress by the President." This stipulation was added in the [Fiscal Year] 2007 National Defense Authorization Act. Aaaaaand that's my jaw hitting the floor. Congress specifically instructed the Pentagon to plan for the future without regard to the money necessary for making its plans reality. At the time, I thought the 2009 QDR was a pretty good document. Others looked at it and saw a wish list. Still others looked at it and saw an incomplete wish list. Now I see that those who considered it a wish list were quite literally accurate. Ex shot back with "Why the QDR Should Not Mention Cost." And the Beard Battle was joined. Department of Defense: "I need to do X, Y, and Z, and here is what I need to do X, Y, Z." Elected Officials: "Great. We will fully fund X and Y but not Z. Given spending priorities elsewhere, we will assume risk there." Department of Defense: "So I understand that if I am called upon to do Z and am unable to do so, the burden of responsibility falls on those elected by the American people and not those commissioned to defend the American people." Unfortunately, I think both guys may slightly misunderstand exactly what the QDR does and doesn't require, though they're closer to the mark in their impressions of how strategy formulation and budgeting ought to go. Let's first go back to the footnote sentence Spencer cited in the CNAS report (which hasn't yet been made public, so we'll have to take his word for it [see update below]): "[C]ongressional legislation prohibits the QDR from addressing [financial] constraints." I'm curious to see the broader context of this statement; at best, it's misleading, and at worst, it's factually incorrect. (4) to make recommendations that are not constrained to comply with the budget submitted to Congress by the President pursuant to section 1105 of title 31. It's important to note that the law treats the QDR and the QDR report separately: §118 (a) requires a review; §188 (b) specifies how it must be conducted and what questions must be answered; and §118 (d) specifies what must be contained in the QDR report along with when and to whom it must be submitted. The bit Spencer and the CNAS authors are talking about is in sub-subsection 4. Read it in context. It doesn't say that the QDR must ignore financial constraints -- only that the requirements identified by the review must not be adjusted or suppressed to fit with the administration's budget request. (The statute further ensures this by requiring in 10 USC 118 (d) that the QDR report be submitted to the relevant Congressional committees "not later than the date on which the President submits the budget for the next fiscal year.") The law isn't saying "don't even think about how much this costs!" -- it expressly requires consideration of budget plans "that would be required to execute successfully the full range of missions called for" in the specified national defense strategy. If we consider this language on its face, it makes perfect sense: the Congress requires the DOD to make a full accounting of what missions, capabilities, and systems are required to execute national strategy with a low level of risk in order to understand how much must be appropriated to that end. Of course, it's hard not to be cynical (aka realistic) about the whole thing and conclude that this mandate exists to facilitate the sort of military-legislative-industrial collusion that ensures near unimpeded increases in defense spending; if legislators require the military to lay out its "requirements" irrespective of administration funding priorities, they can hammer the president for imperiling national security by failing to adequately fund their favored defense programs. This is Congress saying to the Pentagon "do not take the president's guidance about future funding levels as an appetite supressant. Tell us what you need to defend the country and we'll worry about getting the cash." There's a simple way to solve this problem if you're the White House, to keep the military from making an end-run around you to Congress: write a good National Security Strategy (this is not a good one), complete with prioritization of interests and an appreciation of relevant conditions in the operating environment (like for example the nation's fiscal health). You're not going to hear me say this very often, but the law is actually pretty good here: the Department is directed to conduct a review that's based on the requirements of executing the NSS with low-to-moderate risk, not on some out-of-left-field assertion of national defense requirements that the Pentagon has cooked up from scratch. If the president does a good job of setting out his view of America's vital interests and national security priorities, and he happens to define those things more narrowly than the hawks on the Hill do, that's fine; he can be held accountable by those who argue that his view of what's necessary to defend the country isn't expansive enough, but so long as his budget plans are in line with that strategy, he can't be criticized for a failure to appropriately resource the things he's asking the military to do. Where I think Ex gets this wrong is by suggesting that there's a way for the military to punt on missions it's directed to perform, whether or not they're resourced or included in national strategy. The burden of responsibility always falls on the elected government: the Defense Department is merely the president's proxy on matters of defense. And if the military can't execute a mission that the president assigns, there may be plenty of explanations ("we're not budgeted for this," "we didn't plan for this," "you didn't tell us you were going to want to do this in the NSS," etc.) but there are no excuses. The Army and Marine Corps weren't prepared to perform counterinsurgency and stability operations in 2003 and hadn't been given to expect that they'd need to by previous guidance from higher, but they still had to adapt to accomplish the mission. The reality is that if the military is called upon to perform mission Z and found unable to do so, few people will be comfortable with the explanation "but the burden of responsibility falls on those elected by the American people and not those commissioned to defend the American people! ", and Ex knows this. But the current NSS justifies and perhaps even requires a defense program that prepares the military for nearly all contingencies in all circumstances and all climes and places, while the budget will not resource that program. Considering the fiscal and political environment, it seems clear we need a new strategy. Just as a point of reference, let's look at the state of national strategy formulation and publication in the Obama administration. When the president was inaugurated in January 2009, the government was operating under an NSS that was published by the Bush Administration in 2006, an NDS from 2008, and an NMS that was last published in 2004 (and then recertified as current on a two-year basis thereafter, as required by law). The QDR had last been conducted in 2005, with the report published in 2006. The Pentagon conducted a QDR in the latter portion of 2009 and delivered the report (pdf) to Congress on February 1, 2010. The National Military Strategy (pdf) was updated on February 8, 2011; according to the introductory letter by the CJCS, "the purpose of this document is to provide the ways and means by which our military will advance our enduring national interests as articulated in the 2010 National Security Strategy and to accomplish the defense objectives in the 2010 Quadrennial Defense Review." And we still don't have an updated NDS, for whatever that's worth. When a new administration takes office, the White House should publish a meaningful, realistic, and constrained NSS. This strategy should take account of context as well as America's enduring and contemporary national interests to set concrete, achievable policy objectives (ends); describe the general approaches through which these goals can be accomplished (ways); and elaborate the elements of national power that will be created, strengthened, or maintained for application to this general plan (means). This document should be published at the outset of the president's term, as required by both law and reason. Upon publication of this strategy and in accordance with the relevant statute, the Pentagon should begin a review of extant force structure, modernization plans, infrastructure, and budgets to account for the present state of the Department and the nation's military forces in parallel with the development of a national defense strategy -- to be published both as an independent NDS and as a required portion of the QDR report. This strategy should specify the defense-related objectives laid out in the NSS that DoD will seek to accomplish (ends); the types of missions that U.S. military forces will be required to conduct to do so (ways); and the military capabilities necessary to perform those missions (means). The QDR report should specify the changes to the overall defense program the Secretary deems necessary to execute an appropriate NDS in support of the NSS. In accordance with his or her legal obligation to submit "a report containing the results of a comprehensive examination of the national military strategy" not later than February 15 of each even-numbered year, the CJCS should elaborate through the publication of the NMS the Joint Chiefs' assessment of the military capabilities, doctrine, concepts, organization, personnel, and weapon systems required to execute and support the Secretary of Defense's NDS. The NMS should constitute not so much a strategy as a plan: explaining how the military services will execute the operational tasks set out for them in the NDS and the transformational objectives of the QDR report. In light of the significant budget cuts now being considered, civilian leaders should not ask the military to execute the expansive defense plans codified in the Obama administration's National Security Strategy, Quadrennial Defense Review (QDR) and National Military Strategy. These documents did not adequately address the possible effects of budgetary constraints. In fact, congressional legislation prohibits the QDR from addressing such constraints. Word. As should be obvious from what I've written above, I agree: it's the administration's job to make sure the NSS is realistic and attuned to environmental realities, including fiscal pressures. But it's a bit disingenuous to say that "congressional legislation [one wonders what other kind of legislation there is!] prohibits the QDR from addressing such constraints" when in fact that legislation simply requires that the QDR be conducted in line with national strategy. The law puts pressure on the administration to get the strategy right rather than putting pressure on DOD to try to make that strategy work with the limited resources on offer. As Ex wrote, it's the elected leadership's responsibility to say what ought to be done and why, and the Department's responsibility to say "here's how we will accomplish what you're asking." When the means change, you've either got to change your ways, change your ends, or accept a higher level of risk. The law doesn't allow DoD to unilaterally accept more risk, so there are two options: the Pentagon can say "here's a plausible way that we're going to do more with less," or the White House can say "we're going to ask you to do less." If doing more with less were that easy, we'd already be doing it. So national strategic objectives is what we've got left.